Why settle for a single link from a QR code, when you can show several? 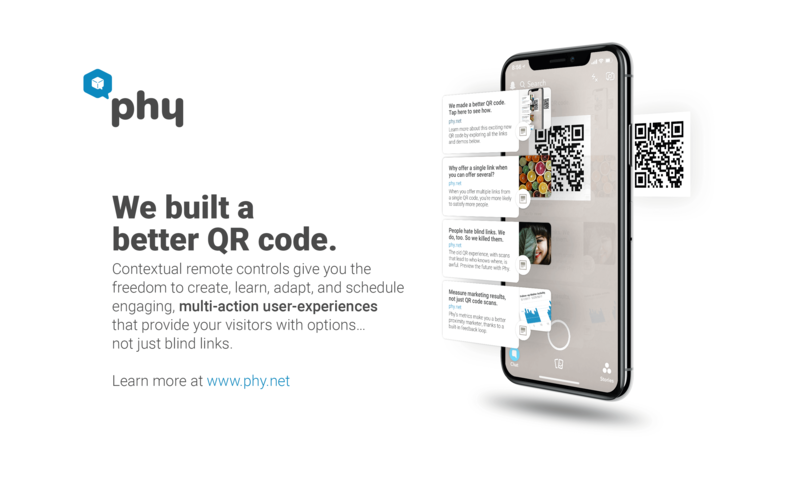 Nashville, TN, February 08, 2018 --(PR.com)-- Phy, the physical channel of digital marketing, has introduced a new QR experience. Instead of one link per scan, Phy-managed QR codes return multiple links, displayed in the familiar format of search results, so users can choose the ones that serves their needs. Historically, four challenges have held QR codes back: friction in accessing a QR scanner, the unpopularity of blind links, not being useful often enough, and the lack of a feedback loop. By integrating QR scanning into its native camera app, Apple almost single-handedly made it frictionless. With an assist from Facebook, Snapchat, Pinterest, and Twitter and their integrated scanners, QR has become truly universal. At the same time Phy has transformed the experience by replacing blind links with previews and by giving people a choice of actions to ensure their needs are met. Phy’s patented three-stage CMS measures scans, impressions (previews of available actions), and clicks (engagement). Capturing clicks closes the feedback loop, telling marketers for the first time what people want when they have a product in hand. The Phy platform doesn’t charge for scans, impressions, or even QR codes. Instead, it is introducing pay-per-click (PPC) pricing, so you’re only charged when someone is interested enough to engage. There is almost nothing to lose by trying it, and so much to potentially gain. This is an illustration of the multi-action QR code experience.